Venus is the closest planet to Earth and has almost the same size. It could be our perfect sister planet if only the greenhouse effect hadn't turned Venus into a baking oven. The average temperature on its surface is 464 °C (or 863 °F), caused by an extremely dense atmosphere consisting mainly of carbon dioxide (CO2). 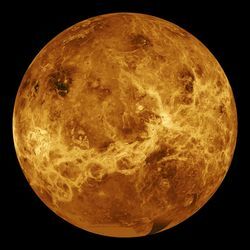 The surface pressure on Venus is 93 bar, 93 times that of the earth. All in all these are conditions under which cou could cook a 16 inch pepperoni pizza in just 9 seconds. It is believed that around 4 billion years ago the atmosphere of Venus closely resembled that of Earth, with liquid water on the surface. But a runaway greenhouse effect seems to have taken control. And periodically something even more frightening happens on Venus! Check our image of Venus unveiled to get an understanding of these cataclysmic events! However, there is a region on Venus that is very much like earth and where human beings could live. It's the higher parts of the atmosphere, at about 55 km in altitude. Here temperatures are moderate as well as the air pressure. But colonisation of Venus with floating cities is mainly the subject of science fiction for now.